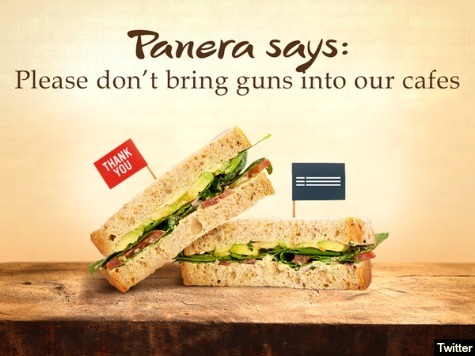 On September 8, Panera Bread bakery-cafes joined Chipotle, Jack in the Box, Chili’s, Sonic, and Target in asking law-abiding customers to shop unarmed in its stores. On July 2, Target “respectfully” requested that law-abiding citizens shop unarmed, and Breitbart News reported the chain was robbed twice in the days after the request was made. And on July 22, just weeks after Target’s request, Breitbart News reported a murder in a Los Angeles-area Target parking lot. On May 23, Breitbart News also covered two robberies and a shooting in the weeks that followed Jack in the Box’s request that law-abiding citizens enter its business unarmed, as well. On September 2, Breitbart News reported that 57,000 businesses were fighting back against the gun control push that led Chipotle, Jack in the Box, Chili’s, Sonic, Target–and now Panera–to ask customers, who adhere to the law, to shop unarmed. Those 57,000 businesses are putting “guns welcome” signs on their front doors.